The Acquarian label first operated from Hattisburg, MS, so it seems. The majority of the label’s gospel releases shows the Hattisburg address. Later, another studio was opened in Jackson, MS. The 5400 series show either the Hattisburg or the Jackson address, all mixed up, which may indicate that Acquarian had (or used) two studios concurrently, at least for some time. In the late 1960’s, again: so it seems, the label moved to Stuttgart, AR. There are only a few gospel releases with this address. 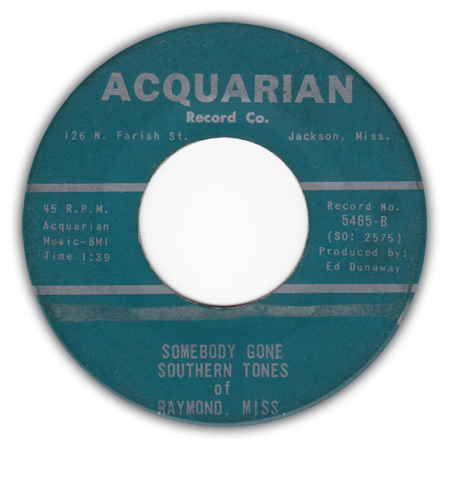 Some sources mention releases on this label as late as 1978, possibly from a Memphis, TN. address. The Acquarian label was run by Calvin Brown. Other names of men involved, were Earl Fox and Rueben Hughes. Affiliated labels include C&F, Central, Downtown, Marathon, Messenger, Riceland and Soul Beat (all information acc. to the R&B Indies). The years given are all estimates. It’s likely that all 45’s and EP’s listed are from the 1960’s, except for a few 45’s, listed at the end of the 45rpm listing. The number of Acquarian 9214/15 (Hazel Chandler) could be incorrect – maybe it’s 9215/16. Acquarian 6459 (Willie Morganfield) was reissued on Jewel 106, Acquarian 6460 (Williams Sisters) on Jewel 107, #5462 (Traveling Echoes) on Jewel 108, #5469 (Mighty Stars of Harmony) on Jewel 102, #5475 (Mighty Stars of Harmony) on Jewel 113. This page lists all known Acquarian gospel releases (45’s and EP’s). 23 Acquarian 13749/50 Young and Albuquerque Spiritual Singers of Albuquerque, New Mexico, Eugene Will You Meet Me b/w Went In The Valley 1961-63? 49 Acquarian ? Moses King and Georgia All Stars? Jesus Will Take Me Home b/w ? 50 Acquarian 6491 Aikens, Henry B. Thomas of Memphis, Tenn., Annie Lee Have Nobody I Can Depend On (But The Lord) b/w There Is No Secret 1968-70's? 51 Acquarian 6494 Pilgrim Travelers of Arkansas Rev. Larry Blood with the Pilgrim Travelers of Arkansas b/w Arthur Blood with the Pilgrim Travelers of Arkansas The Goodness Of The Lord b/w Living In A World Of Sin 1968-70's? 52 Acquarian 6943 Stuttgart Harmonizers A Perfect Day b/w Thank You Lord 1970's? 53 Acquarian 6945 Gates, Rev. Harvey Price Of Love b/w It's Hard To Live In This Old World 1978? 54 Acquarian 6989/90 Five Star Harmonizers He Will Answer Prayer b/w Jesus Is Coming 1970's?